ScooterX Sport Kart 6.5hp Off Road Go Kart 196cc easy start 4 stroke engine makes this off road capable kart one of the fastest on the market. The Sport Kart's classic go kart design is the most popular kart design in the world providing a strong, easy to service kart capable of giving the owner years of service. Scooter X Off Road Capable Sport Kart is the essence of the classic go kart, only better! Sport Kart is designed for teen and adult riders. Built for everyday use. Sport Karts engine is a 4 cycle design, like your car. You do not mix oil in the fuel. This engine uses regular unleaded fuel straight out of the pump. 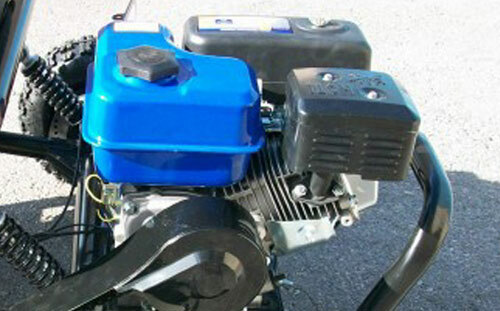 4 cycle engines like the one used on the Scooter X Sport Kart are legendary for their superior dependability and long life vs. 2 cycle engines. Solid state ignition/coil and dependable gravity feed fuel system work together for easier starts and smoother power production throughout all RPM ranges. Easy access to maintenance points. Sport Kart's 196cc gas engine is rated at 6.5 hp enabling the Scooter X Sport Kart to archive speeds up to 45 mph straight out of the box. Sport Kart's Automatic clutch is perfect for all rider skill levels. Simply squeeze the throttle and away you go. 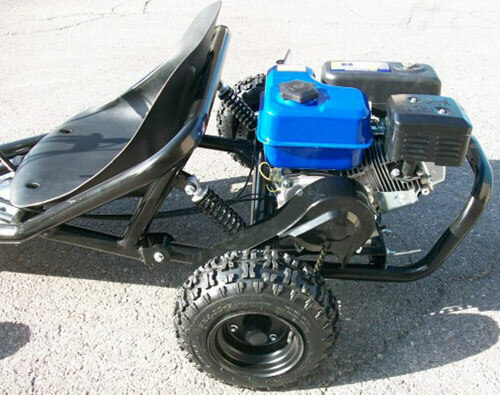 Sport Kart off road go kart's 196cc engine is Carb Compliant. Can Be Shipped To California! Scooter X Sport Kart rear suspension is duel coil over shock system with 4 inches of travel. Sport Kart's "live" rear axle drives both rear wheels giving you twice the traction of most comparably priced karts with single rear wheel drive. 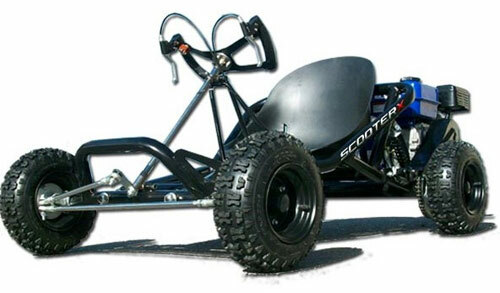 Scooter X Sport Kart frame is large diameter, all steel tube. Strong supports riders up to 225 pounds. Sport Kart seat is strong molded ABS. Seat is contoured to keep driver firmly planted. Rear axle disc brake with vented rotors. Chain and transmission cover for safer operation. Huge 13 inch tall tires give added control and stability. Pneumatic, Duel Purpose Sport Tires. Knobby tread design enhances off road capabilities and hard surface traction. Real Light Electric Vehicle (LEV) tires meet or exceed all safety specs. for their classification. These robust tires absorb shocks and road hazards better and have a higher resistance to lateral forces. Plated steering mechanism helps prevent rust or corrosion. Metal floor pan helps protect driver from rocks or debris. Sport Kart has an aircraft style wheel that incorporates all of the Sport Kart functions. This configuration makes for a very short learning curve enabling the entry level driver to enjoy the Sport Kart in just a few minutes. Not having to use one or both of your feet to activate the brake or throttle means a less confusing and safer environment. Right lever is the variable speed throttle. Squeeze it and away you go. Left lever is the brake. Squeezing it will bring the Scooter X Sport Kart Off Road Kart to a quick and safe stop. Bright red button is the engine "kill" switch. Push it to shut down the Sport Kart's 196cc engine. If you are an experienced kart driver that has not yet had an opportunity to drive a kart with this control configuration you owe it to yourself to do so. MotoTec Off Road Electric Go Kart 1000 48v. Click the button below to add the Scooter X Sport Kart 196cc Off Road Kart to your wish list.